A photo from a 2016 Congress rally in Nagpur was shared by the official handle of Indian Youth Congress with false claims that the image show the high turn out at the recent rally held by Rahul Gandhi on April 4, 2019. 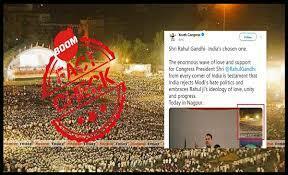 One among the four images, which was tweeted by the Youth Congress, and later tweeted by several Congress party workers, is from a rally that the party held in Nagpur in 2016 and not from 2019 as the tweet claimed. The Youth Congress’ tweet can be viewed below and its archived version here. Shri Rahul Gandhi- India's chosen one. for Congress President Shri @RahulGandhi from every corner of India is testament that India rejects Modi's hate politics and embraces Rahul ji's ideology of love, unity and progress. Yesterday morning it was Wayanad and then late evening it's Nagpur. The image was also tweeted by Vinayak Dalmia, the spokesperson of the party. Turnout for all to see during the rally of @RahulGandhi Ji in Nagpur. Sharing images from yesterday! BOOM analysed the four images and observed that one of the images in the set was grainier than the rest. The same image also had a watermark of Nagpur Today, a Nagpur based news portal and publication house. A keyword search with Congress Rally and Nagpur Today, custom ranged with time, led us to an article published by Nagpur Today on April 11, 2016. The photo was published with an article about Sonia and Rahul Gandhi’s rally from 2016 in Nagpur. BOOM reached out to Neelabh Kumar, the news editor of Nagpur Today, who confirmed that the image was taken by their in-house photographer Sandeep Burghate in 2016. “We are aware of the image that is doing the rounds on several social media platforms. We would want to state that the image belongs to Nagpur Today and had been shot in 2016 and not in the recent rally as is being claimed,” Kumar said. 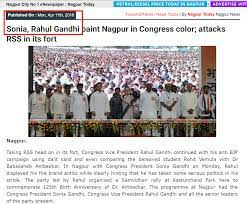 The same photo was tweeted by Gaurav Pandhi a Congress supporter on April 11, 2016 a day after the rally held by Sonia and Rahul Gandhi in Nagpur.